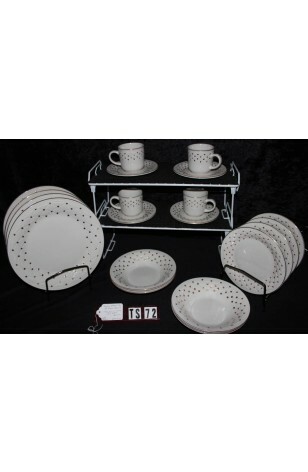 Gibson Designs, Houseware China in the "Golden Basket" Pattern. A 5-Piece Individual Tea or Dinner Place Setting. Priced per each 5-Piece Place Setting. Buy One or All, Click on the Quantity... Circa 2000-2002. Quite a Lovely China Tea/Dinner 5-Piece Place Setting, by Gibson Designs of Housewares in the "Golden Basket" Weave Pattern. A Bright White China, with Embossed Basket Weave, Double Ring Embossed Rims, and Hand Embellished 22kt Gold with Dots and 22kt Gold Rims. So attractive, and yet so seemingly plain at he same time. Great condition. Gibson Designs, Houseware China in the "Golden Basket" Pattern. A 5-Piece Individual Tea or Dinner Place Setting. Priced per each 5-Piece Place Setting. Buy One or All Click on the Quantity... Circa 2000-2002. Quite a Lovely China Tea/Dinner 5-Piece Place Setting, by Gibson Designs of Housewares in the "Golden Basket" Weave Pattern. A Bright White China, with Embossed Basket Weave, Double Ring Embossed Rims, and Hand Embellished 22kt Gold with Dots and 22kt Gold Rims. So attractive, and yet so seemingly plain at he same time. Great Resale Condition unless noted below or in pictures. 1 - Saucer - 6 5/8"